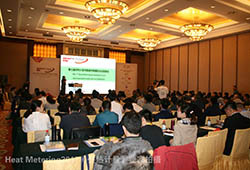 The main conference started at 9 o’clock of 26 April. 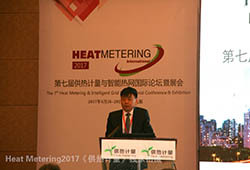 The invited guest from local heat utility Taiyuan Heating Power Co., the event Platinum Sponsor made their special welcome addresses, respectively. 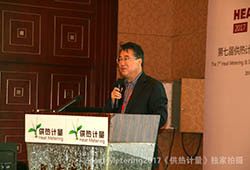 After a short opening ceremony, the experts speeches began. 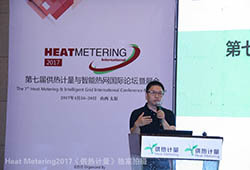 During the two-day conference, a total of 15 experts made excellent presentations, and 10 top experts led a heated discussion, involving heat metering, intelligent grid, smart heating, communication technology, system solution, energy service and such hot topics. 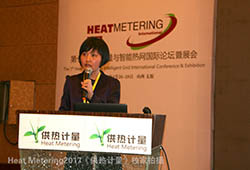 Researchers from scientific institutes, standing on a global level, analyzed the problems, barriers, situations, directions of heat metering reform in China. 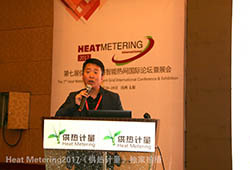 Heat utilities from different areas shared their own achievements, confusions, suggestions and their next steps. 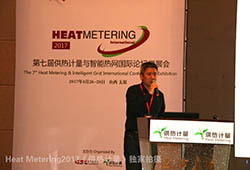 Manufactures and suppliers from home and abroad introduces various advanced technologies, solutions, services and cases, which help promoting and improving heat metering construction in China. 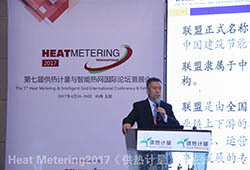 As shown by Mr. James Lau, the principal of Heat & Cool Metering Industry Alliance, domestic heat metering market values is more than hundreds of billions. How to achieve this goal and what to do in 2017 are always the concerns of the whole industry chain. Let’s pay the most attention to our further seminar in the next half year. 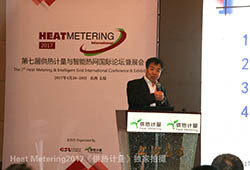 ZHANG Jianwei, General Manager, Taiyuan Heating Power Co.
SONG Wenguang, CEO of Diehl Metering (Jinan) Co., Ltd.
MENG Chun’e, Technical Director of Southern Branch Company, Taiyuan Heating Power Co.
TIAN Yanqing, Director of Metering Department, Taiyuan Heating Power Co.
LIU Yajuan, Senior Engineer, Xi’an Heating Power Co.
QI Chengying,	Professor, Hebei University of Technology / Hebei Gongda Green Energy Technology Co., Ltd.
Christoph Sosna, Head of R&D, Diehl Metering (Jinan) Co., Ltd.
Q2: In particular, where should we walk forward and what should we do? 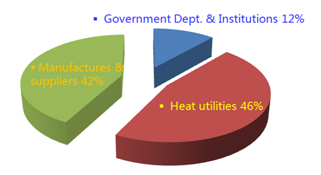 Q3: How to treat the win-win cooperation among heat utilities, suppliers, users and local governments? 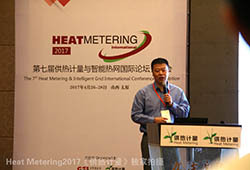 HAO Jun, Taiyuan Heating Power Co.
QI Chengying,	Hebei University of Technology / Hebei Gongda Green Energy Technology Co., Ltd.
XUE Shijun, Beijing Reaching Tech. 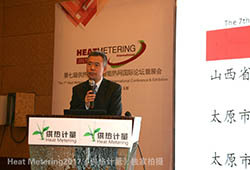 TAN Wensheng, BASIC Intelligence Technology Co. 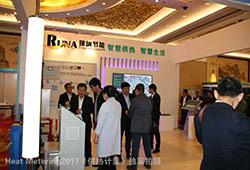 Together with a professional event, project field visit is necessary. Especially when it comes to Taiyuan city, the first phase of Taigu Heat Project has been completed and put into operation at the end of October 2016, it absolutely deserves a look. 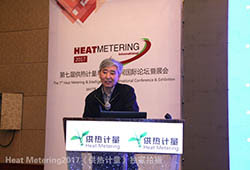 As we know, this heating project is the biggest central heating one all over the world, and also has the most difficulties, benefits and quality. 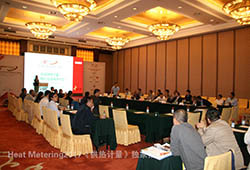 In the morning of 28 April, a team of more than 70 delegates drove to the project site. 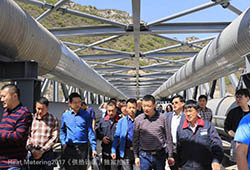 On the road to the destination, the delegates could see long tunnel, the Fen River, long-distance transport pipes, relay energy station… It’s really a long trip, and the views are very spectacular. 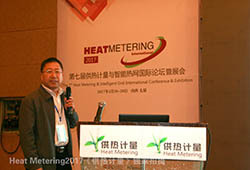 Returning from the project site, the visiting group went to one community with heat metering devices. 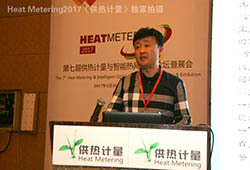 In Taiyuan, heat metering is to the buildings, then allocated among households. Judging from the present situation, this metering method is basically correct. 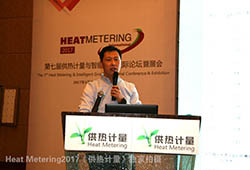 Energy saving effects will become obvious if metering area reaches a third of the whole heating area in the future. 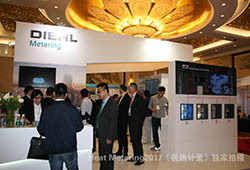 In 2017, there are in total 396 participants, including the visitors, exhibitors and all participants. 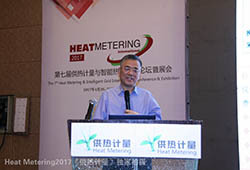 Among them, governmental delegates are mainly from those provinces and cities that are promoting heat metering or will do soon; researchers focus on meter verification, energy metering, thermal design, clean energy and so on; almost all heat utilities are from north China, but Hefei Thermoelectric Group also has a strong participation; For manufactures and suppliers, they are all in the top range of this subdivided and professional market, like heat metering, intelligent grid, energy service, etc.